#VeteransDay is on its way! It might be Halloween, but Veterans Day season is upon us! As you heard last week, IAVA is endorsing events across the country driven and led by our member leaders. 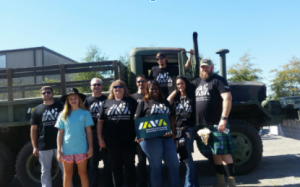 Just this weekend, we saw our very first one–a first-ever Veterans Day parade in Baton Rouge, Louisiana, led by IAVA member De’Cha LeVeau! Check them out below, looks like a great group! We’re phone banking IAVA members in the tri-state area to get them psyched for the NYC Veterans Day parade. Join us! Check ‘em out for more information on what our leaders are cooking up!